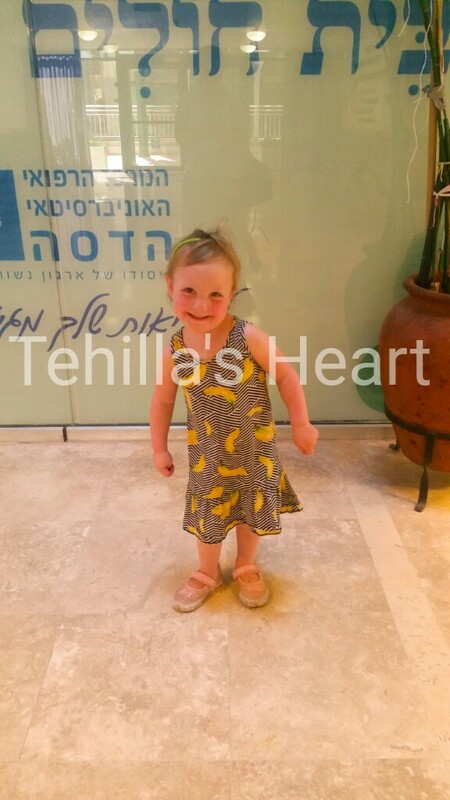 Because of our trip to the US, Tehilla's cardiology appointment checkup was postponed. She is stable enough for this not to be a problem. Driving to the hospital is practically a reflex at this point. No attention is needed for directions. It's second nature. To be honest, it means my head is flooded with thoughts and worries. These appointments are so important but also bring with them an anxiety. The what-ifs take hold and I find myself whispering Psalms while driving. I'm not the only one combating anxiety this morning. Tehilla heard she was going to the hospital for an appointment and her eyes went wide and she screeched "NO!". So we have now had several conversations about this being a "friendly appointment" and not a scary one. They will only put funny feeling gel on her chest and take pictures of the inside of her heart to keep her healthy. She panicked before her vitals were taken but calmed down for a nice blood pressure reading. She hopped off the chair and said, "That was friendly!" Now we are waiting for our appointment. I reduced MY anxiety by not taking care of the insurance paperwork which without fail always gets messed up and sets us back by hours. I paid privately and will just apply for the refund. If this works out nicely, then this might become my new system.